Westmount Dolphins Aquatics Club website! 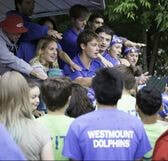 Since 1993, the Westmount Dolphins has offered summer aquatics programs to the community. We are run entirely by parent-volunteers with close ties to the Sports & Recreation Dept. of the City of Westmount. This program is for youth (5 to 17 years old) who would like to develop skills in the four aquatics disciplines: competitive swimming, water-polo, diving and synchronized swimming; compete at a ‘fun’ level and make lasting friendships. The program runs from mid-June to mid-August and is based at the Westmount Recreation Centre (WRC) outdoor pool. Our pool is a member of the Association of Lakeshore Pools (ALPS) which promotes aquatic sports in a series of friendly competitions held throughout the summer. To become a member of the Westmount Dolphins Aquatics Club visit the REGISTRATION PAGE. We cannot wait for Summer 2019! Watch this space for important dates! Monday June 10: AGM, Parents' Information Meeting and Team T-shirt Distribution, 6:35pm Multi-Purpose Room, WRC At least one parent from each member family should attend this important event. We look forward to seeing our 2019 members there! Sunday August 18: End of Season Pot-Luck Party! Victoria Hall Mark this date on your calendars! Aquatics sports require an army of volunteers to ensure that quality competitions are offered to the athletes. Parent-volunteers are an integral part of the Westmount Dolphins. Every family must contribute volunteer-time each summer. If we all give of our time and talents the Westmount Dolphins will continue to offer these great programs every summer! Please sign up to help out at your child's Swimming Competitions today! Youth 13 years and older are encouraged to volunteer as Coaches-in-Training (CITs). Sign up to be a CIT! We would like to thank the City of Westmount for all they do to help our volunteers make these programs a great success! THANK YOU!